So I’m already pretty set on hours for the week, with a big push over the weekend and long days Monday and Tuesday. I’d also volunteered to drop a co-worker off at the airport in the early afternoon. So I hit work early, left early, and was done for the day about 3. Swung back to Jamestown Island on my way home, and decided I’d do a figure 8 of the island. I wanted to see how my legs were feeling before I committed. Anyhow, finally, I got on the road, and was not pleased. For whatever reason, I just didn’t feel like I had any ride in my legs. Then, I had to stop to tweak a minor mechanical about halfway up the first hill, losing rhythym. I was on the verge of bagging it, but decided I’d at least go to the first fork in the road. If I felt bad, I’d head back, go swim, and go home. – On a bike, false flats heading uphill are way preferable to a headwind of any type. – Climbing in the big ring is cool. Lance Armstrong is quick to drop into the small ring and drive a higher cadence. He may not feel as cool while he’s climbing, but winning is cooler than style any day. Lance is cooler than me. – Few things are as beautiful to behold as the grace and efficiency of a well tuned bike. Today’s highlight – the solid “thunk” the chain makes as it shifts under slight load to a smaller cog. – On a constant grade, not pedaling: Sitting up, no hands – 17 MPH. 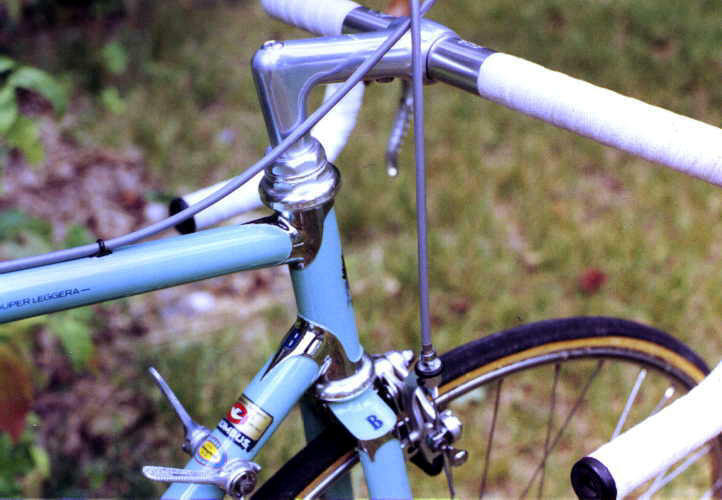 Hands on the top of the bar – 19 MPH. In the drops – 21 MPH. Moral: Spend more time in the drops. – The Atlantic is a cold ocean. This was my first 20+ mile ride of the year. I’m not happy about that, but am thankful it’s a time issue rather than a fitness issue. Total was about 25 miles in about 90 minutes (I accidentally reset my odometer at mile 15, so I lost the time on the first part) It’s also my first above 16 mph average ride of the year, so I’ve got two things out of the way. Lafe asked for clarification on the gloves/no gloves comment on Tuesday – My primary reason for wearing gloves is to avoid road rash. There are few things more painful than spending a couple of weeks pulling gravel out of the palms of your hands. When I ride with only a small probability of encountering cars, I’m much more likely to go all out, dive into corners, and “ride it like I stole it” than if I’ve got to worry about traffic (specifically, my phobia of falling down and getting run over). Hard cornering leads to wheels slipping out from under, which leads to hands on pavement, which, without gloves leads to picking gravel out of palms. The point being that for riding in a deserted parking lot, the biggest risk I’ve got is in laying the bike down and getting a bad case of road rash. When cars come into play, therea are two likely scenarios. The one I’ve lived is getting cut off by a car who doesn’t see you, and then stops to turn in front of you. I’ve hit a couple of cars that zoomed by, threw on their brakes, and swerved into driveways while I was at speed and couldn’t either weave back into traffic, or head into a ditch. So I t-boned the car, went flying through the air, and came much closer to landing on my head than when I’ve laid down bikes. The other scenario is a car just flat-out not seeing the rider and plowing him/her over. When this happens to me, I want to be able to land on my head and drag myself away. I do want to be clear that I think that not wearing a helmet should be an exception, not a rule, especially when riding hard, or riding in traffic. Reading your post today made me realize I should take my bike back next summer for the Jamestown ride. I was debating not taking it since there’s so much traffic around in South County. Sorry this particular ride wasn’t at the top of your list. I’m sure the next one will be. Sorry – the ride was great. Poor writing on my part. The regrets were about tight legs at the beginning, and that I hadn’t done a long-ish ride all year. But Jamestown is quickly becoming one of my absolute favorite places to ride. The traffic is minimal, the shoulders wide, and the roads, while not great, are adequate. The terrain is nice – rollers with a couple of decent climbs. And there’s plenty of parking. I don’t really understand why the island is so deserted. Probably because Newport’s across the bridge, and is a much bigger tourist attraction, and I don’t think there is much sandy beach on Jamestown. But that’s fine – as a place to bike, it’s great. Thanks for the clarification on the gloves. Childhood memories of picking gravel out of my palms suddenly return to me. Not interesting, really. But I park at a state park that’s got a small, rocky beach at the boat launch, so when I ride here, I usually go and soak my feet. Wednesday, I went swimming. Not in the working out sense, more in the kind of lazing around floating sense. Very nice. But there was much shrinkage going on when I got out of the water.